1988 Toyota Pickup is...Just Like Home. Albeit, the quarters are indeed downsized, but when you spruce it up a bit and remain in the mindset that you’re really going to be outside of your quarters most of the time…it really pans out nicely. Well, in this instance we’re talking small, portable living quarters that don’t require towing around with you on separate axles. 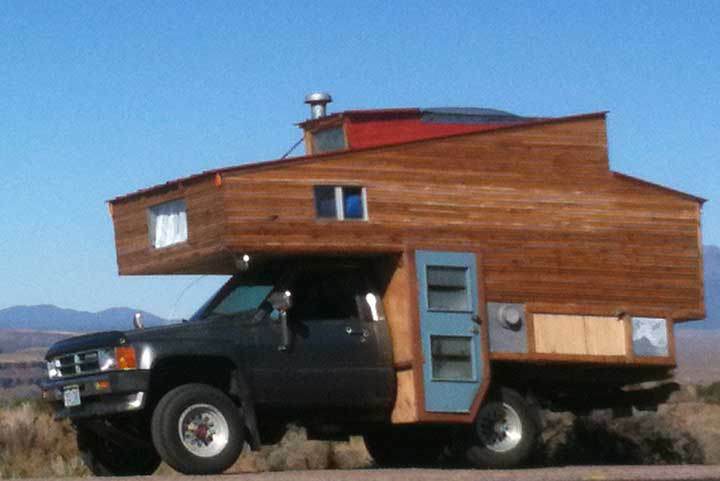 This particular 1988 Toyota pickup has a portable apartment instead of a truck bed. 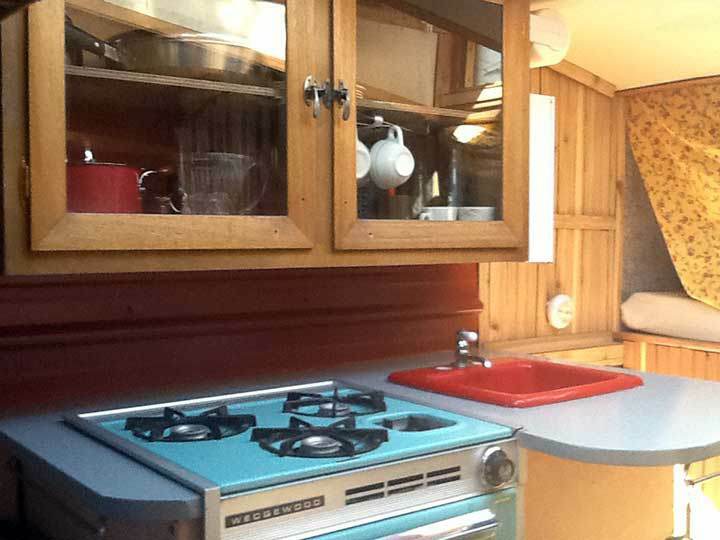 Owner Mark Rislove calls it his “Hippy Shack,” and uses it as his ski chalet. The rig is 98 square feet, and features a queen-sized bed over the cab, a small couch in the center, a twin bed in the rear, a 7-foot-long ski locker, heated boot locker, domed skylight, a propane heater, sink and countertop, overhead cabinets, and a wood-burning stove. The real deal with Mark’s creation is the fact that it’s entirely composed of salvaged materials, utilizing someone’s old redwood deck as a frame and siding. 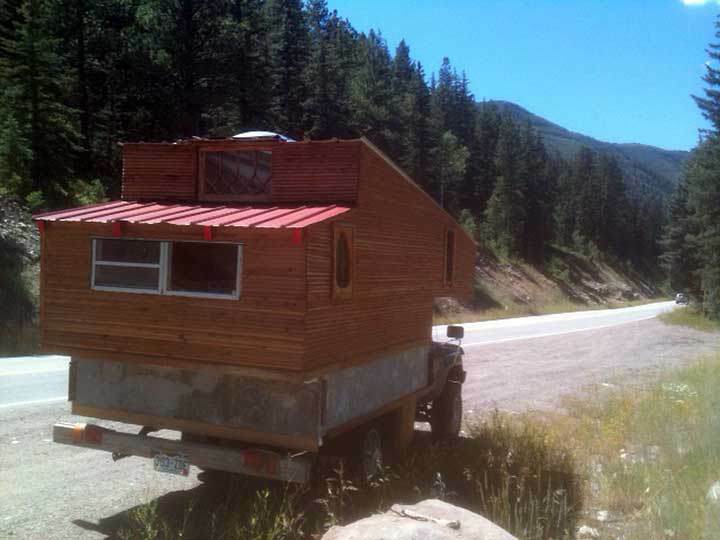 It’s easy to image how much fun this little truck bed turned portable home could be while out on the slopes. Cheers to Mark Rislove for such a neat and functional build. Just a quick note, Elizabeth… The “Hippy Shack” doesn’t belong to Lew Lewandowski… It was built by and belongs to me, Mark Rislove. Lew was kind enough to feature it on his blog, theshelterblog.com. I’m hoping when you say “Homely,” you actually mean “homey,” and the “heated book locker” you mention is actually a heated boot locker, as I’ve never seen much need to keep my books warm. If we really want to get technical… “The Hippy Shack” sits on a 1988 Toyota Hilux, as I believe the Tacoma was not introduced by Toyota until sometime in the mid to late 1990’s. While I appreciate the write up, maybe next time you could check your facts a little closer and maybe even hire a proof reader… “toter home”…? Mark, I’d first like to thank you for taking your time to ready my work. Secondly, thank you for the feedback, as a writer, I appreciate that you took your time to respond more than you could imagine 🙂 I wanted to apologize to you first as a fellow auto enthusiasts about not giving you credit, and also not doing your ride justice. I’ve had that happen with my car before, and it’s a little irritating…to say the least! Then, I’d like to apologize as a writer to my reader for the errors and typos. A new version has been submitted to replace this, and I hope your happier with that one and also continue to follow the blog. Mark, thank you for taking the time to read the post and check out the site. I apologize for the errors made and have submitted a revision to take the place of what’s currently published. The headline was not meant to insinuate that your truck was plain or anything shy of awesome, just a catchy little play on words 🙂 But it will be changed. I also sincerely apologize for misnaming the owner — I actually have a vehicle that’s profiled a lot and have had the same problem, it stings when you don’t get credit where credit it due. So in short, as an auto enthusiasts to another, I apologize. As a writer to their reader, I am deeply embarrassed, but also grateful for your time and feedback.